Sometimes it may feel like your bank account is draining. 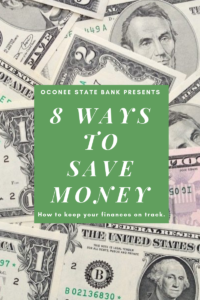 There are several actions you can take to steadily save money and avoid that uneasy feeling. No matter how young or old you are, these simple tips will help you save money and keep your finances on track. One easy way to save money is by cooking at home instead of spending money eating out. Not only will you be saving your cash but by eating at home you can use healthier ingredients, choose your own portion sizes, and avoid food allergies. According to Forbes.com, “We found on average, it is almost five times more expensive to order delivery from a restaurant than it is to cook at home”. It’s a smart idea to time your big purchases of things like appliances, furniture, electronics, etc. according to your annual sale periods. Don’t buy anything hastily, either. A good tip is to always wait a day or two before purchasing an expensive item to avoid experiencing buyer’s remorse. Discount stores like Ross, Aldi, Costco, and TJ Maxx offer the same products you would buy at other retailers for a fraction of the price. In addition, if you don’t have time to clip coupons, glancing at sale ads is a smart, quick way to save money. Compare prices at local stores and look for potential discounts on items you know you’ll be buying. Pro tip: Many grocery stores offer price matching with competitors, which can save you dollars without forcing you to take multiple trips to different stores. A savings account is a place where you can store cash securely while you earn interest on your money. Using a savings account creates some distance between everyday spending money, kept in your checking account, and cash that’s meant for a later date, like an emergency fund or vacation savings. A huge step to saving more efficiently is to keep track of what you spend and budget. There are many different ways to do this, try a few out and choose the system that works best for you. The key to saving more successfully is to find a system that works for you and to stick with it. Putting aside just 50¢ over a year will get you 40 percent of the way to a $500 emergency fund. And some banks and credit unions or apps offer programs that round all your purchases to the nearest dollar and put that money into a separate savings account. Empty your pockets each day and start collecting that extra change. Then take your collection to the bank and put it directly into your savings account instead of your checking account. When you want to watch your spending, use dollar bills instead of credit cards. It’s harder to part with cold, hard cash. Take advantage of free days at museums and national parks to save on entertainment costs. You can also ask about discounts for seniors, students, military members and other discounts when purchasing tickets for everything including movies, concerts and theme parks.